DC dazzled Comic-Con with a humongous trailer for Batman v Superman, filled with superheroic action, our first look at Wonder Woman and Lex Luthor in action, and much more—but there were also plenty of little clues and hints about the movie woven in. Join us as we take a deep dive and break the trailer down for you! The trailer opens with a female senator declaring that “Today is a day for truth”, as Superman lands at Capitol Hill—judging by the angry crowd of anti-alien protesters waiting for him, it looks like Clark Kent is about to face some repercussions from his destructive spree stopping Zod in Metropolis. Despite the opposition, Superman calmly walks in as the Senator continues to question what Superman really came to Earth for: “The world needs know what happened, and what he stands for”. ...And then Superman and Zod flying out of it, bringing the towering skyscraper down behind them as Bruce runs towards it. But why is Bruce Wayne so angry? As you can see from the wreckage, the building destroyed was Wayne Financial—and the loss of employees to the battle will make Batman’s conflict with Superman later in the movie much more personal, according to Ben Affleck. The same Senator then declares that they hold Superman responsible for the destruction, so pretty much no one likes Superman at the moment. We then transition to a shot of a man—presumably Jeremy Iron’s Alfred—walking towards what appears to be the burned out ruins of Wayne Manor. It’s not the first time Wayne Manor has been put through the ringer on film: of course, in the Christopher Nolan trilogy the Manor was burnt down by Ra’s Al Ghul and rebuilt, but it would appear whatever tragedy occured in this new Batman’s past, rebuilding the Wayne homestead was not on his list of priorities. Our first look at the Batcave, which is more like a swanky underground bunker than a cave. Is it still under the ruins of Wayne Manor? Looks like Bruce Wayne is just as popular as Superman as the moment, as he opens up a letter containing a report on the destruction of Wayne Tower—of course from The Daily Planet—with an ominous message scribbled over. Hate mail from a survivor? The use of family is a little pointed given Batman’s origins, but as we’ll see later in the trailer, it’s not a reference to Martha and Thomas Wayne’s death. Bruce starts working out as Alfred takes his turn to narrate, presumably talking to Bruce: “That’s how it starts... the fever, the rage, that turns good men cruel”. Batman is back on the streets of Gotham, as members of the GCPD discover Batarangs at crime scenes... and bat emblems seared into the skin of a would-be-criminal. Presumably this is the cruel rage Alfred was warning Bruce about. News of Gotham’s vigilante reaches the Daily Planet, and Clark gets into an argument with Perry White over whether vigilante justice is right—as White tells him that “nobody cares about Clark Kent taking on the Batman”. DC and Warner Bros. beg to differ! People hate what they don’t understand. Be their hero, Clark. Be their angel, be their monument, be anything they need you to be. Or be none of it. You don’t owe this world a thing. You never did. ... and it turns out to be none other than Jesse Eisenberg, a.k.a. Lex Luthor! We already know at some point Lex goes bald in the movie, thanks to a previously released promo picture, but all the Lex we see in the trailer is with this wavy long hair. 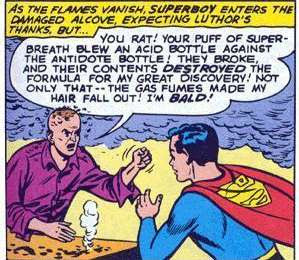 There have been multiple reason’s for Luthor’s iconic bonce in the comics—originally it was from a chemical spill accidentally caused by Superboy, driving Luthor into a grudge, but more often than not it’s hereditary. We don’t know how Batman v Superman will handle it, but we do know we’ll see Lex Luthor lose his locks at the very least. As we see Lex leaning over a seemingly-defeated (or even subjugated—Superman is kneeling) Superman, he tells the Senator that “Devils don’t come from the hell beneath us—they come from the sky”. It’s also interesting to note that Lex’s hand is bandaged in the above scene with Superman, and as he puts his hand over Clark’s head, he never touches him, and Clark recoils slightly from the hand. Lex’s bandage isn’t wrapped that tightly—does he have something hidden under it? A tiny shard of Kryptonite to control Superman with? Lex Luthor’s assistant—we saw her escorting the Senator into Lex’s room earlier—hauls away a box from the USAMRIID (the United States Army Medical Research Institute for Infectious Diseases). What’s inside? The very dead body of General Zod! It seems like this version of Lex is more than little paranoid about aliens visiting Earth, if he’s sneaking around with Zod’s body. Did he convince the Senator to decry Superman for the Metropolis incident to cover his own designs on Zod’s remains? ... And on closer inspection, it’s the suit of Robin. Or, more specifically it looks like, was. There’s what looks like a few bullet holes in the chest, and the yellow-green spray paint scrawl pretty much confirms that The Joker was responsible for the death of Robin sometime in the past. We already know that Batman and Joker have a pre-established past in this new DC Universe—Batman even shows up in Suicide Squad in scenes presumably set before Joker and Harley’s arrest—but is this the event that caused Bruce to give up on being Batman? In the comics, there have been many Robins—and although we don’t know which one this alludes to the death and involvement of the Joker in said death seems to heavily point to Jason Todd, who was murdered by the Joker in the infamous 1988 storyline A Death in the Family. It’s taken us two minutes into the trailer, but we finally get to see some footage of Wonder Woman! Or rather, her alter-ego Diana Prince, dressed up for a swanky party. Pictures released just before Comic-Con show Diana eventually dancing with Bruce Wayne at a party, and Ben Affleck hinting that in the scene both alter-egos know each others secrets—with Zack Snyder describing Wonder Woman as the “gateway drug” to the Justice League, is Diana here to sort things out between Superman and the returned Batman to help form the basis of the League? Another shot from the first trailer, as four soldiers kneel before Superman—notice how they all have Superman’s “S” on their shoulders, too. Batman, wearing his heavily armored suit, powers on the Bat-Signal for seemingly the first time in a very long time—not just to signify his return, but presumably to grab the attention of Superman. Bruce warns that Superman has the power to wipe out all of humanity, and decides that he has to stop him. A young boy finds something in the ocean—and if you look closely, it’s a body. At first I thought this was a flashback to Clark being pulled out of the water following the oil rig collapse in Man of Steel, but look at the length of hair on the body. It’s way too long to be Clark. Is this quite possibly our first look at Jason Momoa’s Aquaman? It’s hard to make out if any of the tattoos are there, but maybe. Another flashback, this time to the murder of Thomas and Martha Wayne by petty crook Joe Chill. Add it to the supercut. The Batwing flies over a burning island—is that Gotham in the distance, or somewhere else? Finally, our first look at Wonder Woman in action, and she is not pleased. Diana smacks her bullet-deflecting gauntlets together to create a shockwave, but not the one we see in the trailer, which is a much larger, more devastating blast that takes out a chunk of a city. Is this what was burning earlier, that the Batwing flew over? Batman, wearing goggles and a duster over his Bat suit, emerges out of a bunker into a desolate environment. Is this a flashback, or is this the aftermath of that huge explosion? As Alfred tells Bruce that (presumably Superman) “is not their enemy”, we see Lex Corp burning as someone—maybe Lex himself?—races towards it on a motorbike. If it is Lex, he’s got every right to be in a hurry: Lexcorp is home to a big hunk of glowing Kryptonite that he’s rather obsessed with. ... to fire at Batman, who uses his grapnel gun to dodge out of the way! But is then definitely totalled as Superman tears the front off, ready to go toe-to-toe with Batman. Did we miss any details? Don’t forget to use the image annotation feature and let us know in the comments. Batman v Superman: Dawn of Justice will be out in 2016.